Scholars disagree on the meaning of the name Amazon. Some say that it means "breastless." This comes from the belief among the Greeks that the Amazons cut off the right breast of each girl so that she could handle a bow and arrow more easily. Other scholars believe that the name may mean "without grain" (or bread) and may have come from the Greek word for barley, maza. They reason that the Amazons, as hunters, ate only meat and did not make bread. Origins. 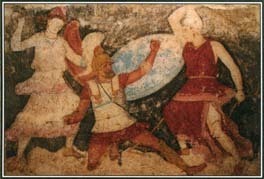 The legendary Amazons, an all-female society, lived in southern Russia or northern Asia Minor*. From time to time, the women had relations with men from surrounding tribes and bore children. The Amazons kept and raised only the girls, killing or making slaves of the male children or sending them to their fathers. cases, these were matriarchal societies, in which a family's name and property passed down through the mother's side of the family. To the Greeks, with their patriarchal society, this practice seemed unnatural and barbaric. They therefore created stories about fierce, man-hating women. In many Greek tales, the Amazons are defeated and killed by male warriors as punishment for taking a role considered appropriate only for men. In this painting from the 400s B . C ., two Amazons attack a male soldier. A warlike tribe of women, the Amazons were thought to be descendants of Ares, the Greek god of war. Amazon Legends. The Amazons appeared frequently in Greek myth and legend. One of the 12 labors of Hercules* was to capture the belt of the Amazon queen Hippolyta. When Hercules reached the land of the Amazons, Hippolyta received him warmly and agreed to give him her belt. But Hera, queen of the gods, convinced the rest of the Amazons that Hercules was kidnapping Hippolyta, and they took up arms and attacked him. Believing the queen had tricked him, Hercules killed her before sailing back to Greece with the belt. In another Greek tale, the hero Theseus* attacked the Amazons and carried off their queen. The Amazons responded by going to war against Athens, but Theseus defeated them after a terrific struggle. During the Trojan War*, the Amazon queen Penthesilea brought extra troops to help the Trojans after the death of the warrior Hector*. For this, the Greek hero Achilles* killed her and then fell in love with her corpse. The Amazons also appear in works by the Greek writers Herodotus and Apollodorus. Powerful female warriors also appeared in the folktales of Slavic peoples from southeastern Europe. Led by the warrior Vlasta, these women lived in a castle by the Vltava River. They were aggressive not only in their battles with men but also in their pursuit of them. In one story, Šarka, one of these women, fought the Slavic hero Dobrynia. She grabbed him by his hair, pulled him off his horse, and put him in her pocket She released him only after he promised to marry her. In most of the stories, the female warriors ended up either dead or married to a hero. The legend of the Amazons lived on long after the time of the ancient Greeks and Romans. In the 1500s, the Spanish explorer Francisco de Orellana claimed to have met a tribe of female warriors while exploring the Marañon River in South America. He supposedly renamed the river the Amazon in their honor. To this day, aggressive women are often referred to as Amazons. See also Achilles ; Aeneid, the ; Hera ; Hercules ; Iliad, the ; Theseus .